Use GoldenDict to run Longman Dictionary. 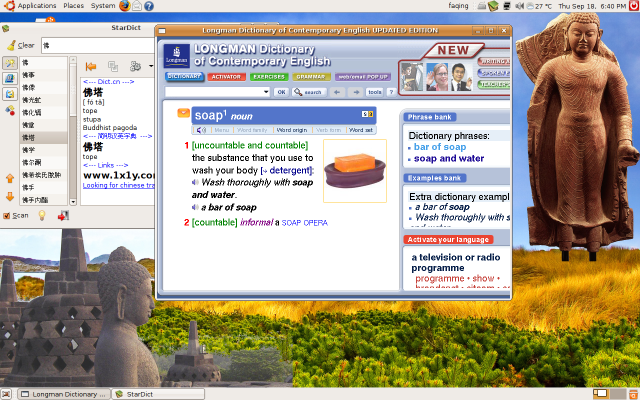 Longman Dictionary Contemporary of English 5th DVD Edition works perfect in Ubuntu 9.04. 2. Copy the DVD to your harddisk, go to the linux directory. 3. In Ubuntu 8.10, it will automatically install the Desktop Link. If you cannot find the link, you can create a Launcher by using "/usr/local/ldoce5/ldoce5"
If you switch to another user, it may fail to start. Than you need to copy "/home/yourname/.macromedia" to another user's folder. 2. copy the first cd to one folder. Note: This dictionary can run at your home directory without touching root. #1Submitted by Anonymous on Sun, 2018-07-29 01:10. #2Submitted by Anonymous on Mon, 2015-07-20 11:41. #3Submitted by Anonymous on Fri, 2012-02-17 06:23. #4Submitted by Anonymous on Fri, 2009-09-25 20:04. After install LDOCE5, in the LDOCE5 folder there is a folder named "plugins". I had tried to replace the old version of "libflashplayer.so" in the plugin folder. But after that the New version, 10.0.32.18, of Adobe Flash Player (libflashplayer.so) didn't work with LDOCE5 well. Do you know how to upgrade the flash player for LDOCE5 in Ubuntu 9.04 in the best way? #5Submitted by Anonymous on Sat, 2011-03-05 21:52. Upgrading adobe flash player is possible, but that would need some if not lots of hacks to modify flash related configuration files. On the other hand, popup-mode dictionary doesn't work on a native Linux installation( No QuickFind counterpart in Linux ). It might be better to switch to WINE for the sort of thing you like. #6Submitted by Anonymous on Fri, 2009-08-28 18:27. #7Submitted by Anonymous on Mon, 2009-07-20 14:29. #8Submitted by Anonymous on Thu, 2009-02-19 20:04.
do you not have the source of the installation? #9Submitted by Anonymous on Sat, 2009-01-24 10:11.
i have ubuntu 8.10, what can i do to have it work? #10Submitted by Anonymous on Tue, 2010-09-21 03:43. I experimented this, but couldn't determine the cause. Some image readers load the sh files as binaries. Try using another image reader. #11Submitted by Anonymous on Mon, 2009-01-26 16:41. Please try to install again. Make sure you have installed "libgtk1.2". #12Submitted by Anonymous on Wed, 2009-05-20 18:04. I'm having the same problem and I'm pretty sure that "libgtk1.2" have been installed on my com, i'm using Ubuntu 9.04. What should I do? Thank you. #13Submitted by Anonymous on Thu, 2009-08-06 19:59. Do you have any suggestion? thank you. #14Submitted by Anonymous on Fri, 2009-08-07 00:15. Longman 5th DVD works great in Ubuntu 9.04. Try to get the 5th DVD verstion. #15Submitted by Anonymous on Wed, 2008-12-17 23:36.
i installed ldece but it didnt work. i couldnt run ldoce.sh. i found the ldoce.sh file but it didnt work. i installed full recomended things but it didnt. please help me. i like very much it. #16Submitted by Anonymous on Thu, 2008-12-18 04:57. #17Submitted by Anonymous on Sun, 2008-12-07 17:30. Does the sound work for anyone? #18Submitted by Anonymous on Tue, 2008-12-09 03:52. #19Submitted by Anonymous on Sun, 2008-12-07 16:03. #20Submitted by Anonymous on Mon, 2010-03-01 00:51. When i called sh installlation , it again installed the program from the CD. Not from the files which i had copied to the hard Disk. Why? #21Submitted by Anonymous on Sat, 2011-03-05 21:57. To play sound while running this dictionary, you have to load kernel module snd-pcm-oss.ko by "sudo modprobe snd-pcm-oss"
#22Submitted by Anonymous on Wed, 2012-07-11 13:29. #23Submitted by Anonymous on Sat, 2014-02-08 07:48. #24Submitted by Anonymous on Fri, 2012-01-27 04:16.